Campers are apparently not welcome at the Chillerton Down site! 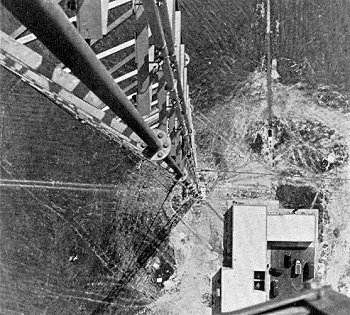 The ITA station at Chillerton Down - on the Isle of Wight - opened on 30-Aug-1958 transmitting Southern ITV's VHF 405-line signals to the South of England. Our first main photo was taken by Mark Carver in the early 1990s. It shows the two BT SHF dishes at the top, which at that time formed a telephone link between the UK and the Channel Islands. - the receive station on Alderney is probably line-of-sight from the top of the mast. The dishes were removed about 5 years ago, and presumably replaced by a fibre optic link.